Ploughing and planting of all crops began in October. The plough was normally pulled by cows, not oxen, or even occasionally by men it was guided from behind by the ploughman, who wielded a whip to encourage his team whilst pushing down on the plough with all his might with the other hand. The team was often guided at the front by an assistant, usually a boy or young man, using a stick or shouting encouragement. If the soil was exceptionally heavy or hard it was broken up manually using hoes. While the corps was ripening, work did not cease. Land away from the river might need further irrigation later the season as the soil dried out. This was done using done water from the network of canals that crossed the cultivated land. The water was led to the fields via small ditches separated from the canals by sluices. To get the water onto the soil, however, required heavy manual labour. No mechanical lifting system was known before the New Kingdom, when the shaduf was invented. This consisted of a tall upright post on which pivoted a long cross-pole, which could swing freely in all directions. At one end of the pole was a water container and at the other a heavy counterweight. The container was filled from the ditch and the weight raised the water ti the required level. Unfortunately this useful aid seems only to have been used to irrigate gardens, the labourer in the filed having to continue this backbreaking task by land .The saqqieh , or water wheel, commonly seen in Egypt today did not appear until Ptolemaic times . Other problem which the farmer and to contend with were pests, such as birds or insects and flash storms which could flatten the grain as it ripened, The effects of these natural enemies are graphically described in the Biblical look of Exodus, in which the plagues visited on Egypt by the Hebrew god are catalogued. Against insects and the weather there was little recourse except prayer, but against the birds some action could be taken. Small boys were set in the fields, or in gardens, to make loud noises in order to scare the birds away. Spring traps were set to catch individual birds, but in the case of a whole flock descending. g, groups of men or boys would ensnare them in a large net and then kill them for food. Towards harvest time other pests invaded the farmers' fields. These were the tax assessors who came to gauge the yield of the crop and set the amount to be taken in dues. The bustling activity if the harvest is shown in a scene from the tomb of Menna at Thebes. The sequence begins on the left-hand side of the bottom register. Menna sits beneath a shady baldachin watching the progress of his workmen, while a servant offers him a cool drink from a flask. In the field the harvesters are watched over by a scribe dressed in white linen. The men work short curved sickles. One of the labourers is seen talking a drink from a jar proffered by a young girl picks up gleanings dropped by the harvesters. Above the girls is a nursing mother, seated beneath a tree, with a bowl of food for the workers' break. Further along we see the harvested grain being taken from he field in large baskets carried on poles by pairs of men, At their feet children are gleaning and two girls fight over their finds. Gleaning by the families of field-workers was a traditional way of supplementing the low pay given by landowners if they were able, the harvesters might intentionally drop ears for the benefit of the gleaners. Beneath a tree sump a pair of idlers, one of whom is playing a flute. 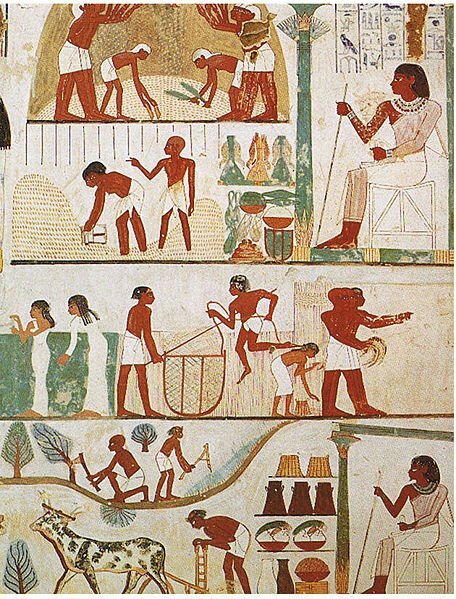 They may be harvesters tacking break or servants of Menna waiting for him to complete his inspection, At the end of the bottom register two men are shown forking over the ears of corn on the threshing floor prior to turning loose oxen to trample the grain from the chaff. This process is depicted at the beginning of the register. A man drives a team of four beasts, while two others turn over the grain with forks. The next scene shows winnowing. A group of workers pick up the trampled ears in flat, wooden scoops, one in each hand. They toss the grain high in the air, causing the chaff to blow away in the wind, while the wheat falls back to the ground. The final scene shows the scribes again at work recording the harvest, measure by measure. It is now that he tax and rent, assessed earlier, are taken away. If the peasant could nor or would nor pay his dues, he was usually beaten mercilessly by order of these petty bureaucrats. Once the harvest was complete the grain was taken for storage in granaries .... 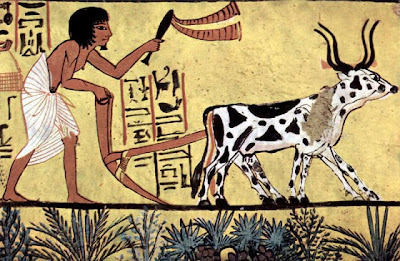 Ancient Egypt Agriculture . The harvest was presided over by the goddess Renenutet, who is depicted as a cobra of a cobra-headed woman, as this snake was often found in ripe corn. In harvest scenes a swollen crescent shape is often shown above the winnowing floor. This may represent a type of corn-doll, perhaps another symbol of the harvest deity. The owner of the estate had to give her offerings of corn, birds, bread, cucumbers, melons and other fruit in thanks for a successful harvest, and no doubt other, local deities also received a share the bounty.